For millions of fans around the world, Jean M. Auel’s Earths Children series is unmatchable for story or quality. When it was announced that this series would be drawing to a close with the publication of the sixth and final novel, The Land of Painted Caves, in March 2011, her fans felt a mixture of sadness and anticipation. What would become of the characters they had grown to know and love since the publication of the first novel, The Clan of the Cave Bear, in 1980? In The Clan of the Cave Bear, we met and grew to love Ayla, a young Cro-Magnon girl living during the last ice age, who was adopted by the Clan, Neanderthals. The Valley of Horses saw Ayla alone, having been forced away from the Clan by their new leader, and she raised a horse and cave lion – but she soon met Jondalar, a man like her. They lived together in The Mammoth Hunters, with the Mamutoi people, but their relationship faced tough times. In The Plains of Passage they made the long and treacherous journey home to Jondalar’s people, the Zelandonii, and The Shelters of Stone saw Ayla learning the customs of her new people, and becoming accepted by them. She gave birth to her and Jondalar’s daughter at the end of the novel. The Land of the Painted Caves continues not long after The Shelters of Stone left off – Jonayla, their daughter, is still a baby, and Ayla has not long begun her training to become a Zelandoni, one of the spiritual leaders and healers of the people. This training is not normally undertaken by those who are mated, particularly those with children, so how will this affect Ayla’s relationship with Jondalar? The detail included in the Earth’s Children novels is stunning. Auel is respected by archaeologists worldwide, and it is clear to see why. Nothing is vague or left unsaid about the people, their lives and culture, or the landscape and animals of the time. Everything is described in spectacular detail, giving the reader a vivid picture of how these people lived. There are long passages describing the landscape, or the way the people hunted or made tools, in addition to necessary story details such as the relationships between the characters. The Shelters of Stone was quite a “homely” novel compared to the first four novels of the series. While they had been full of upheaval, excitement and noticeable events, The Shelters of Stone was more settled as Jondalar and Ayla had reached their home, and now Ayla was learning about life there. In some respects The Land of the Painted Caves is similar. It seems very settled as Ayla and the First Zelandoni, leader of the zelandonia who is training her, along with Jondalar and sometimes others, undertake Ayla’s Donier Tour, in which she visits the sacred caves of the region. Life goes on, and there are a couple of gaps in the narrative of a few years. But then everything is upset, and the novel is no longer calm and settled. Of course there was excitement along the way as they made their tour, but later in the novel nothing seems certain like it was before. Much of the story of The Land of Painted Caves draws on what has happened in the previous novels. While past events were frequently referred to and stories told among the characters, they didn’t have as much bearing on the story as they do in this final novel. This makes for an interesting and enthralling story, as the events of past novels and Ayla’s story are important to fans, and now everything is being brought together one last time. The knowledge and experience that characters have built up in previous novels is brought to the fore, and many events bring a sense of déjà vû for both characters and the reader. 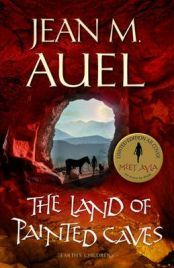 The Land of Painted Caves is as beautifully written and structured as Auel’s earlier Earth’s Children novels, yet the emotions is brings to the reader are very different. Knowing that this is the final instalment of Ayla’s story bring sadness that we won’t have any more books to look forward to. But on the other, the general premise of the novel, that Ayla is settled with the Zelandonii and is mated with Jondalar and has a daughter, bring happiness – after all, this is all she ever wanted and she is a beloved character. The Land of the Painted Caves is a stunning novel, as is the whole Earth’s Children series. While for some it may not match up to the wonder they felt on reading The Clan of the Cave Bear, this is a beautiful and fitting end to a saga beloved by so many. Many thanks to Hodder & Stoughton for providing a review copy of The Land of Painted Caves. 7 Comments on "The Land of Painted Caves"
Was disappointed in the end of the last book. It was a hard read seems how they went over a lot of boaring stuff. In the last section the book started to become a much better and remembered ready from jeans last 5 books. What a dissapointment I at least thought she will meet up with her Clan son and her lost family…. so sad waiting all these years for this…. Hmmm we must have been reading totally different books. Even as a die hard fan of JMA, I’d have to disagree with your “beautifully written” comment. This book felt rushed and unpolished, was smattered with contradictions and while full of wonderful descriptive passages about the caves, missed the mark when it came to being a cohesive story. Needless to say, having anticipated this closure to the series for so long, I was very disappointed in the book. I must admit Daleen I was hoping for the same – I didn’t mention it in my review so as not to dash others hopes though! So so dissapointed with this book, waited so long for it and found myself skipping pages. No real story, just going over and over old ground. Thought she would have a least met up with her old clan, trained more horses for use of other clan members, etc , so many other stories could have been written. Dont feel any closure. Really disappointed in the final book. Far too much time dwelling on the landscape and looking at caves. Ms Auels die hard fans were interested in the characters and whether Ayla would ever meet Durc or Ranec again. So many storylines could have been explored, encountering the old Clan, more domestication of animals. After years of waiting, the ending was a real anti-climax.